"See-through" grooves and wide, lateral traction slots carve out a modern five-rib tread design to provide excellent all-weather performance. 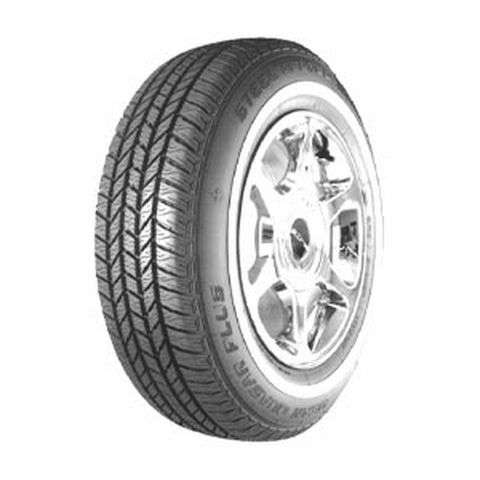 Elongated siping in the shoulder elements enhances the tire's gripping ability in diverse weather conditions. A narrow white stripe captures the style of OE tires on popular automobiles. The white rubber compound is formuated to stay bright and clean for easy maintenance. Blackwall sizes are offered for the generation of car enthusiasts who prefer pure sports sytling...even on the family sedan. P205/75R-14 520AB 1,521 lbs N/A 11/32nds N/A 8" N/A 26"
Purchase includes the Dean Quasar Plus tire only. The wheel rim shown in the picture is not included. Picture provided is a stock picture from the manufacturer and may or may not reflect the actual product being ordered. All Dean Quasar Plus tires are continuously developing with manufactured improvements. With that said, Simple Tire and the manufacturers have the right to change these tire specifications at any time without notice or obligation. Please Note: Specifications of the Dean Quasar Plus tires shown above are listed to be as accurate as possible based on the information provided to us by Dean tires. This product is covered by a 55,000 mile manufacturer’s treadlife warranty.